This subterranean seafooder has been going strong since the 70s for good reason: the seafood is fresh and the atmosphere is pure retro-fun. 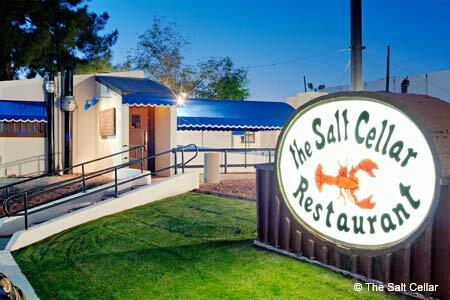 : A Valley landmark since 1971, this oasis in the desert is an underground gem --- literally. Just the roof sticks out of the garden parking lot, and guests descend a dark, skinny staircase to the basement dining room and bar. The treasure chest opens to showcase fresh seafood in the traditional American style, with Maine lobster, Alaskan king crab, sea bass (blackened Cajun style is popular), Alaskan halibut or oysters Rockefeller. Besides the pristine fresh seafood, the prices are a lure, reasonable and including dinner salad, fresh baked bread, vegetable and choice of baked potato or lemon pecan rice.